What's New at Make Baby Stuff - Everything! Welcome! Welcome to our very first newsletter, delivered fresh to your email box. A huge thanks to all of you who signed up before even seeing a back issue...wow, that is faith! We'll try to make sure it doesn't bite, although it is the very first issue after all, so bear with us, it'll get even better, I promise. We've got a lot of new articles up in just the last week. A Felted Sweater Mouse Puppet Tutorial and Soft Blocks Sewing Tutorial to name a couple. Who: Amber Woodmouse of Woodmouse Loves Wood is a "craft at home" mama who makes wooden baby toys. 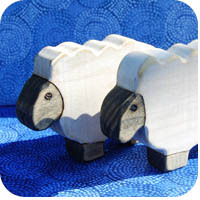 How did you get started making wooden toys? I had an interest in woodworking from back in middle school wood shop and messed around with it on and off for a number of years. After my son was born we made an effort to avoid plastic toys and be more "green" in our lifestyle but the fancy wooden toys were expensive. So naturally, I dusted off my old woodworking skills and got to work! At first it was purely to make toys for my son and save money but I enjoyed it so much that on a whim I opened an Etsy shop. How or where do you get ideas for your toy designs? I draw all the shapes myself. I'm not very good at drawing. This means that my animal shapes look very much like they did when I drew them when I was five. Somehow, these childlike renderings capture the essence of the animals though. It works. What other baby crafts do you like to make? Everything I have time to! I'm not a huge sewer, but I dabble a bit. Mostly I'll alter or add things to baby clothes rather than make things from scratch. I like to embroider and stencil and I've attempted a stuffed animal or two. I've just learned to knit so I'm hoping to whip up some baby hats soon. When do you find time to craft? Good question! If only I spent more time crafting while I was pregnant rather than surfing the internet for junk to buy, lol. Seriously, it is hard, especially since woodworking is not a baby friendly craft. My husband gives me a couple hours of crafting time here and there. I need those precious hours to keep me sane. Long gone are the days when I could work for 7 hours straight on a project. Oh how I miss those days! What are your future crafty plans for your business? None, really. I plan to keep it as a hobby. I really enjoy the leisure of making things when I have time but not being stressed about orders. I took on a wholesale account where I have to make huge quantities at once and it was really hard. It is hard to enjoy making the exact same thing over and over. Of course I do have ideas about future toy designs, perhaps some vehicles and maybe more sets so new stuff is on the way. If you were an animal what would it be and why? A mouse of course! I think that question was made for me. I'm taking back the term "mousy girl" and refreshing it. There isn't anything bad about being mousy. Mice are cute and small and quiet. They watch everything and know that is going on in a household. They sit in the corner and observe but they have this inner secret world past their cute little arched mouse door that is awesome. They use thimbles as stools and tiny matchboxes as storage bins. Oh wait, that is only in cartoons. Can I be a cartoon mouse? 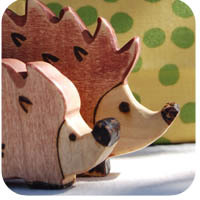 Check out her awesome wooden toys at Woodmouse Loves Wood and buy handmade! I'm going to a baby shower right around Easter. I want to do something sort of Easter related but NOT too Eastery. I mean, I don't want to like, make a stenciled onesie with an egg on it or something since that won't make sense when the baby is actually born a few months later. Do you have any DIY ideas for something I can do? And I don't sew so making a stuffed bunny is out. Hi Kim, thanks for writing in. Of course I do! Okay, I didn't at first, I had to think about it for a little while having never been in this exact position before. Since the baby isn't actually due on Easter (it is just an Easter baby shower, right?) I would avoid actual Easter themed gifts. Yes, I would have said a stuffed bunny since bunnies are groovy all year round and aren't exceptionally "Eastery" but since you don't sew then forget it! How about skipping an "Easter theme" for the gifts themselves but getting creative with your packaging? Easter Baby Shower Packaging Idea One: Obtain an empty cardboard egg carton. This is as easy as buying eggs at the market and um, eating the eggs. Make sure the egg carton has no broken eggs of course, no egg goop on the carton! I would suggest laying it out open in direct sunlight for a couple hours. This will kill any possible salmonella or other yuckies that hang out around eggs. Next, paint it! Paint it with acrylic paints or even spray paint in the colors of your choice, as long as the paint is opaque and completely covers all text. Alternatively, you could decorate it with pretty papers or collage. Finally, fill with cute and colorful rolled up baby socks. Newborn onesies will even fit and so will washcloths. Easter Baby Shower Packaging Idea Two: An Easter basket of gifts! Find a basket. Run, don't walk, to a thrift store now and you can probably still snag one for cheap. A plain wicker one can also be painted with acrylic paints if you like. Fill with clothes, small toys and other small items. Add some bows and ribbons and voila, an Easter themed gift. Don't forget to include a little something for the mama...what is an Easter basket without at least a piece or two of chocolate?